The Guidelines for use of the Online Research Notebook [DOCX 42KB] are now available and are recommended reading for all researchers using the Online Research Notebook. If you have any queries about the Guidelines, please contact the Manager, Research Infrastructure or the Library's Research Team. La Trobe's Online Research Notebook allows all researchers in all disciplines to digitise their work as it's created - whether capturing ideas for a literary tome, designing an experiment or acquiring and linking data. Powered by LabArchives, it's an application developed to replace paper research notebooks. 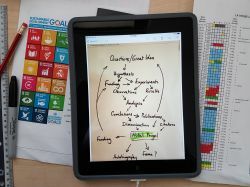 The Online Research Notebook can be used by an individual researcher or research team to manage, store and link digital research data, including any type of file.